What did I eat during my recently finished weightloss process? What am I eating while maintaining my weight right now? This is a good alternative to plain tortilla chips. This one has a great flavor. 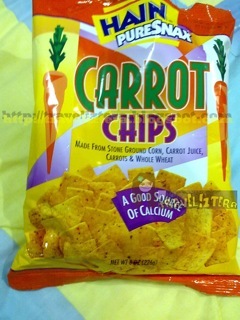 It isn't bland and if you're not a fan of carrots, it's okay because this doesn't have a carroty taste. This one's so addicting! I totally love this! I'm sure you've seen these cookies everywhere! I used to ignore them but when I tasted HONEY NUTS, I GOT TOTALLY HOOKED! Nuts are essential in a healthy diet. Make sure they are either raw or oven roasted with no salt nor oil. 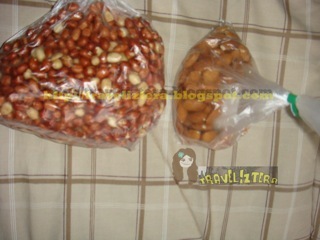 WHERE TO BUY: Peanuts Stands (uhm duh me! haha!) But I buy my almonds at Healthy Options. Who said they're banned from healthy eaters!? My rule is TO NEVER DEPRIVE YOURSELF. Of course, you still have to watch out for those calories but it doesn't mean that you have to entirely avoid them. You can eat them in moderation. It's important that you're still enjoying foods such as this. 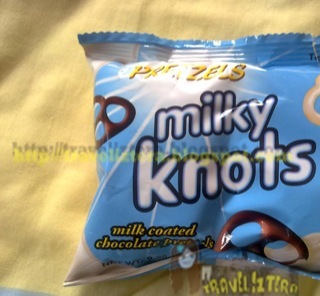 I TOTALLY LOVE PRETZELS MILKY KNOTS!!! YUMMM! WHERE TO BUY: Almost any grocery store in the Philippines... You can also see them at Sari-Sari stores/stands. I love TORTILLA CHIPS! 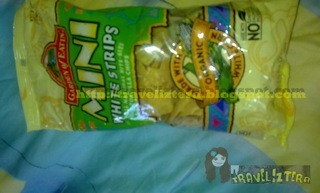 I've seen yummy chips out there that are also low in calories but this one's awesome because this is organic! If you're into PROTEIN, then this one's for you. 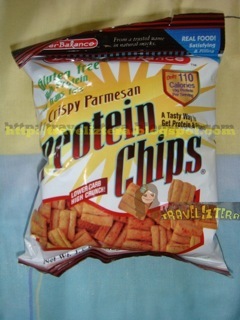 Due to its high soy protein content, this bag only has 110 calories with 0 g of saturated fat! Talk about having chips with no worries about the calories! This one has different flavors such as Chili Nacho Cheese and White Cheddar (but the calories are higher than this Crispy Parmesan one). The calorie's somehow high but it's a good alternative to those who usually skip meals. Have this rather than starving yourself!!! NEVER skip meals. This one is a grab and go food with only 3g of Net Carbs , 1g of Sugar, and 15g of Protein. I'm not really an advocate of products with "low carbs" or "low fat" labels or claims since there will definitely be a compensation among the other nutrients/ingredients, not making the calorie count lower (and if you want to lose weight, you should be checking the calorie count first--not if it is low fat or low carbs), but whenever I'm craving for sweets such as cakes and brownies, which are higher in carbs than in protein, I go for these babies instead. Atkins Endulge. See next item. 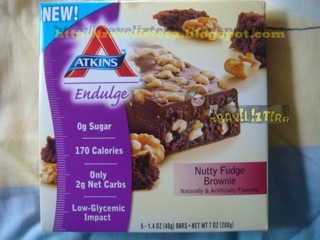 The calorie's lower than ATKINS ADVANTAGE (the one above) because the PROTEIN content is only 7g. Despite a lower amount of protein, there's only 0g of Sugar and 2g of Net Carbs in this treat. You might have noticed that I'm into PROTEIN right now. Well, protein is more filling and lower in calories compared to CARBOHYDRATES. Anyway, I will discuss that later on in my future entries. 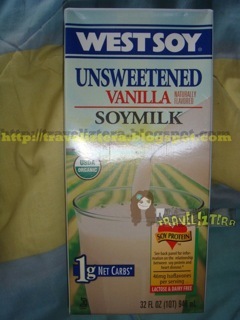 I usually mix my soymilk with my whey protein shake for awesome protein combos. 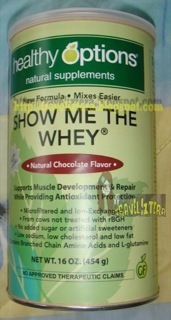 Just like the one above, I drink this with my whey protein shake. Most of the time though, I partner this with my cereals. A good post-workout snack is a protein shake partnered with a skim or soy milk. One tip in eating is to eat airy foods such as popcorn, popped chips, and POPPED CORN CAKE! One cake is only 50 calories and there's 0g of fat! Thanks to Mara for her request! :D That became a reminder because I had a plan before to blog about the foods I eat whenever I'm trying to control my weight. 35 Travelers with Comments. Click to comment! WHY YOU'LL GLOW - "Eating a handful of almonds every day boosts levels of vitamin E, one of the most important antioxidants for skin health," says Baumann. You'll get a surge in moisture too - a boon for those prone to dryness. HEALTH BONUS - Though nuts are high in calories, women who ate them at least twice a week were less likely to gain weight than those who rarely did, in a new study of over 50,000 women. -- Prevention magazine, April 2010 issue. Em - Thanks for the additional info! ;D Hahaha go health enthusiasts!!! :D I totally <3 almonds hahaha! nice useful tips. ahve u tried fat burning soup? JAG - damihan ang protein! hahaha! mukang pareho kami ng problema ni pareng jag...protein lang ba talaga kelangan para mag weight gain? Great post. I love almond and roasted peanuts. I'm sticking with Milky Knots ahahahahahaha. Saka na ko magdidiet kapag may beltbag na ako... but your site is admirable the way you try to help those who are... challenged hehehe. eii ^_^ sis i've been trying to lose weight as early as 17 y.o!! but I didn't get any good result (sob)!!! >> am not that fat, pero talagang malaki ako!! (malaking bulas)!! and everytime I've tried so many things to diet palaging bigo!! nag exercise din ako!!! pero so far carry pa naman ang weight!!! POSTED THE AWARD YOU GAVE ME IN MY NEW PAGE!!! :) THANKS AGAIN TRAVELIZTERA!!! Thanks for following Georgia's simply pretty things. I am your new follower :). Thanks for posting this. My main problem is really portion control. I mean, it's so easy to finish 1 whole bag of chips or 1 big bar of chocolate thinking that it's just one serving... yun pala 1 bag sometimes is 6 servings! haha. Btw, you can include the new Nestle Yogurt with Jelly here :) 1 cup only has 70 calories. MARIE - they really are yummmyyy :D thanks for visiting!!! SUPER G - hahaha hi! :D thanks for droppin by! ;) HOP HOP! Ferryjjoi - carry pa naman db? ;D to be honest, minsan, kahit payat, d okay tignan... may mga tao talaga na nadadala nalang talaga sa way nila ipresent sarili nila :D dba!? :D weight is no longer an issue -- confidence na toh! hehe! Ribka - Thanks so much!!! Kate - No prob! ;D Yes that's true! :(( That's why people find it weird for me to be counting how many chips I've already eaten everytime I eat the huge bags which have plenty of servings ! hahaha! Thank you for reminding me about the Nestle Yogurt Jelly snack! I also eat that! hahaha! I like the pandan flavor! good snack tips! 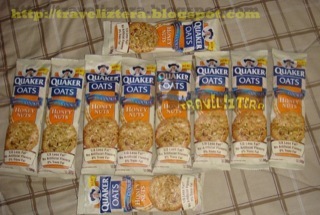 i am always looking for new healthy snacks for work that dont need to be refrigerated. 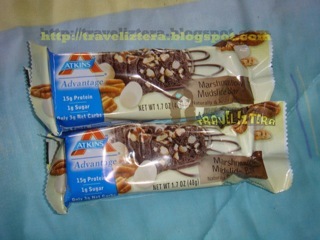 naks, ang travel blog naging health blog na.. hehe..
click on Contact Us for their locations. This is great! List of snacks that are all good for dietary program. At least, its not hard at all.